Portugal is awesome. After spending 8 nights traveling with Mrs. Barred in DC and our third-wheel buddy in mid August, I highly recommend making a visit to the small, beautiful, relaxing, affordable country on the Iberian Peninsula. We hadn’t been expecting to make it to Portugal any time soon, but couldn’t pass up a $430 flight deal courtesy of The Flight Deal (DCA via PHL on American Airlines). 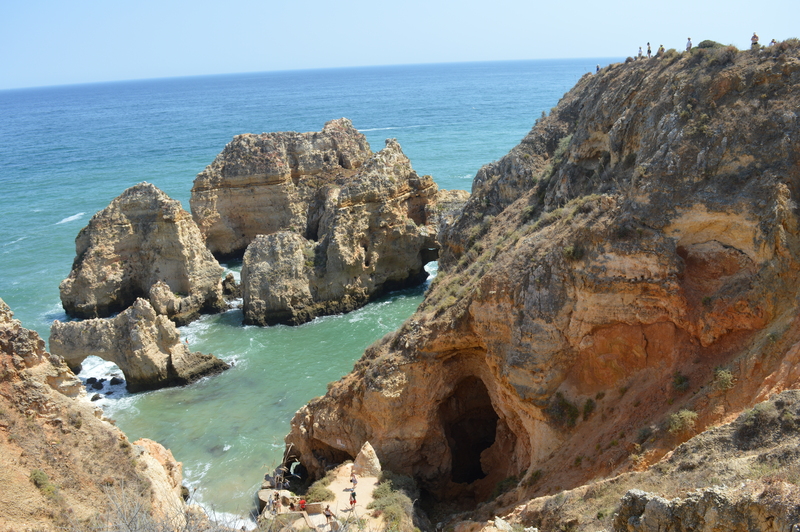 Eschewing a car, we instead relied on bus, train, Uber, and day tours to check out Lagos in the southern region of Algarve, Porto in the north and, of course, Lisbon. The Portuguese are incredibly friendly and proud of their country. English is spoken everywhere, though it’s nice to learn “obrigado” or “obridga” (thank you, depending on whether you are a man or woman). 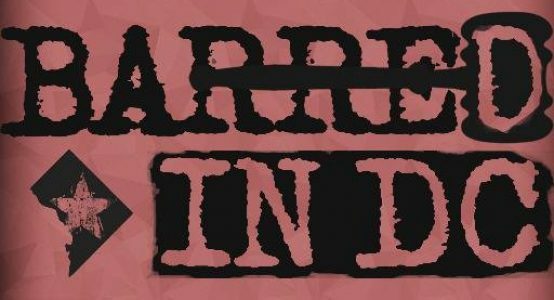 A quick dive into food and drinking culture and a detailed itinerary, with recommendations, follows. The food is terrific and cheap in Portugal. We ate tons of fish and seafood (grilled whole sardines in Lagos, octopus everywhere, cod fritters, tinned fish), pork, and potatoes. We usually ate at nice restaurants and entrees were usually in the low teens and never more than 17 or 18 euros. For lunch, sandwiches could be had for 2-3 euros often. We drank a ton of beer and wine in Portugal as they were also dirt cheap and hit the spot. Most bars only had one or two options on draft, almost always Super Bock (refreshing) or Sagres (trash). These beers (around ~5% ABV) were generally offered in 20 cl (6.8 oz) mini bottles/draft pours, 35 cl (11.8 oz)-most common, or 50 CL (16.9 oz) sizes. 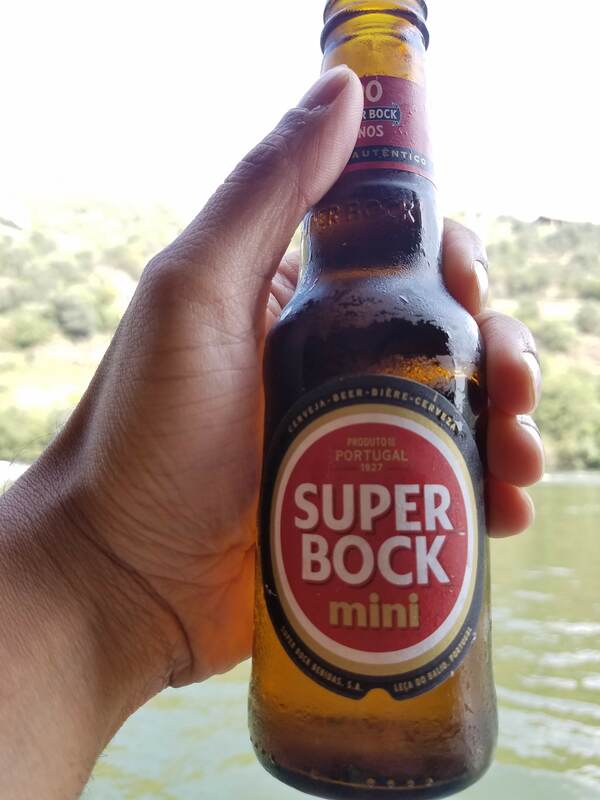 Craft beer connoisseurs may feel differently, but we took a shine to Super Bock (light-flavored, refreshing in the heat) beer and drank gallons of it (you can get 33 CL $5.25 bottles at Nando’s around DC, though it’s not quite the same). In a few spots in Porto, the 1927 selections from Super Bock were offered in great glassware on draft, which I highly recommend (IPA, Dunkel, Lager, and a Weiss beer). Beer was never more than 2 or 3 euros, so those went down smooth. Wine-wise–Tasty vinho verde (“green wine”; a bit fizzy), along with reds, whites, and ports, were ubiquitous. Even at nice restaurants, half bottles of wine were usually the standard way to order and were only 7-8 euros (at one restaurant we ordered a full bottle of wine that was 22 euros and we were legitimately upset at the price like the terrible Americans we are). Cocktail-wise, we found nice cocktail bars (craft cocktails for 9-10 euros usually). Even if kind of trashy, almost all bars had the following on the menu: mojitos, caipirinhas, caipiroskas, sangria, and something called the morangoska (basically a strawberry daiquiri). These cocktails were usually fairly sweet and cheap (5-6 euros). Simple highballs like gin & tonics, bourbon & cokes, etc. were often the priciest things on the menu so they were rarely ordered. I do recommend getting a “Portotonico” cocktail which is great and refreshing even if you don’t like port (made with white port). Because open container laws are not really a thing in Europe, particularly Portugal, it was common at many bars for the bartender ask if we wanted a drink for “take away”; if we said yes, they would pour in a plastic cup so we could drink on the street (even when there’s no sidewalk patio) or walk to the next spot. This was helpful as unfortunately smoking in bars isn’t prohibited (note this is not true for restaurants) by law so in some spots it was better to be outside. 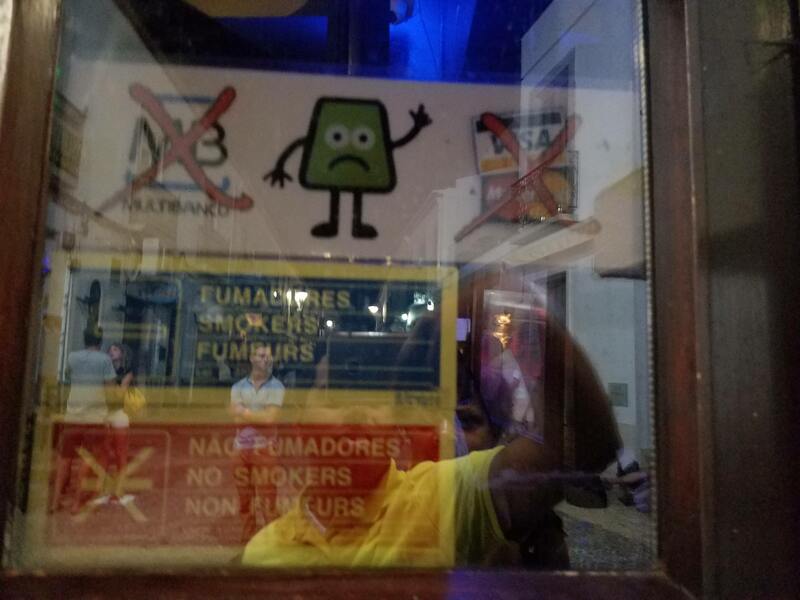 Of note, although credit cards were accepted at most restaurants and businesses, it was hit or miss whether they could be used at bars (you’ll see a “No Multibanco” sign or, more amusingly, a graphic with a picture of Visa and Mastercard with a big X on them). Many restaurants didn’t actually have bars with seats; just service bars to serve drinks for seated diners. Bars close at 2a generally, but many seem to be allowed to be open until 4a (unclear why). Super Bock. We drank a ton of these (slightly larger size usually). After arriving on the red-eye in Lisbon, we took the subway (just a few escalators down at the airport exit) 3 stops to the Oriente stop (you can also take an Uber, which are plentiful in Portugal, to there or the Sete Rios bus station). 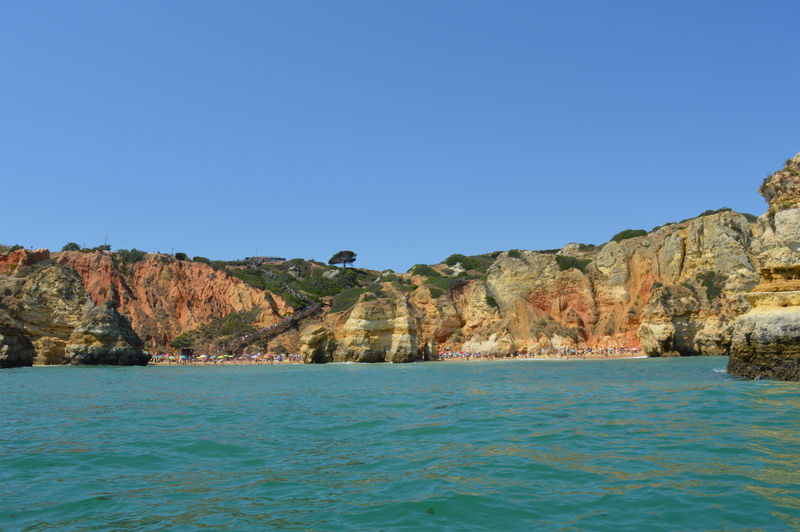 From there, we grabbed a 19 euro Rede Expressos bus (allow about 2 hours from arrival and the bus time) down to Lagos in the Algarve region off the Atlantic Ocean. A little over 4 hours later, we arrived in the beautiful, relaxing, mostly pedestrianized town of Lagos. If you make it there, I highly recommend booking a flat with Cosy Flats (via booking.com), which offers spacious apartments with A/C in a building just steps from main square. Food: Lagos itself is just a relaxing spot to stroll around town, eat/drink at cafes, etc. Highly recommend grabbing dinner at Casa do Prego; the place does not take reservations, but sends you upstairs to their peaceful roof deck patio which is exclusively for those waiting for tables for dinner. Servers come around to take cocktail orders, which are then added to your dinner tab. Al-Bravo is a solid spot for a healthy lunch (with a couple craft beers offered as well from the Cerveja Bolina). Drinks wise-Lagos is full of outdoor patios and bars full of young Brits and other Europeans. Peppers, with a cool roof deck a block or two off the main strip, was a highlight, and we enjoyed the live music at Myst. Spots with a slightly older crowd are focused on Rua 25 de Abril, with a few more local spots a block behind on Rua da Sra. Da Graca, and the younger crowd up the hill (The Tavern had a crazy crowd outside). We bar hopped over the course of two nights at least 7 more bars. After Lagos, we took a 44 euro 7 hour train (well two, a change in Tunes from a slow to a high-speed train; book when tickets go on sale-6-7 weeks out-to get a good rate) from one end of the country to the other to Porto (pronounced “por-too”) in the north. In Porto, we stayed in a great Airbnb in a highly recommended area 10 minute walk west of the Sao Bento train station. We loved Porto, despite it being hilly as hell. To explore the town, we walked downhill from where we were staying, took a peek inside the stunning interior of the Sao Bento train station, checked out the impressive cathedral, explored the waterfront Ribeira district, and grabbed a quick shuttle boat across the Duoro River to the other side (technically another town called Vila Nova de Gaia). The other side is replete with what Porto is famous for – port wine lodges/cellars. 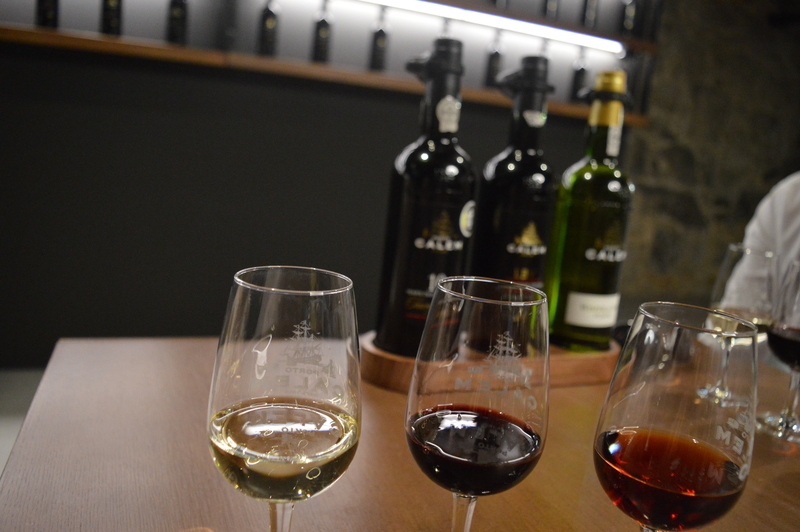 Most (unless they have a separate bar/restaurant) seemed to require you to take a tour to have tastings; we stopped by Calem (get the 15 euro 3 port tasting premium) for a 30 minute tour followed by tastings and the bar at the prolific Sandeman port house. Port, for those of you unfamiliar, is a type of wine fortified with brandy; it’s generally pretty sweet and an after-dinner drink. We tried ports of the tawny, ruby, vintage, white, and the derided “pink” style. For years, port could not be called “port” unless it was actually finished in Vila Nova de Gaia. If you’re meh on port, if you’re also doing a tour to the Duoro Valley (see below), it’s OK to skip a tour of a wine lodge if you’re pressed on time. Food: Our best meal of the trip was in Porto – tascö near where we were staying. Traditional food served in a hipster-modern style and atmosphere. Get reservations (you can stop by and ask) or you’ll have a 4 hour wait. Dinner for 3 with drinks was about 40 euros. A Grade (heavy emphasis on seafood, get the baked octopus) was a nice cozy spot near the riverfront where we had dinner as well. 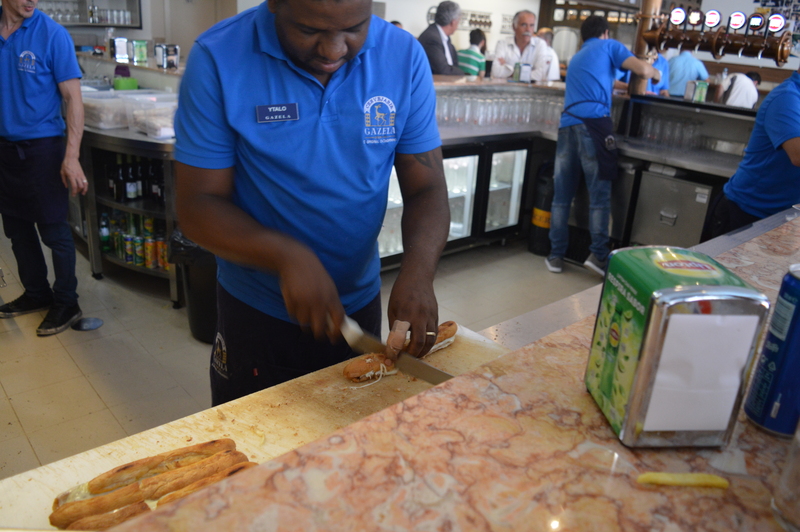 For lunch, I recommend hiking up to Praça da Batalha and checking out the Gazela snack bar (Cervejaria Gazela) and the famous cachorrinho sandwich (sort of fancy hot dogs on grilled bread chopped into several pieces; there are now two locations across the square from one another. Drink: Aside from the port lodges, we avoided the touristy bars near the water and focused on checking out the Rua de Cândido dos Reis (and the parallel R. de Galeria de Paris) lined with late night spots and a lively, younger scene (befitting the nearby University of Porto). A couple notable spots on the strip include Pão Que Ladra, the Royal Cocktail Club, and the Bierhaus. A couple blocks away, on top of an elevated park (Passeio dos Clerigos) built a top some business was one of the coolest open-air bars I’ve ever visited-Base-a sprawling bar on a lawn with olive trees, and little cushioned benches and tables. Hiking further north, we found great cocktails at Mundo, a chill café-type vibe at Café Candelabro (bless the bartender who sighed heavily when a dude ordered a mojito late night), and a cozy patio at Aduela Taberna around the corner (great beers and cocktails). If you make it to Porto, I highly recommend taking a tour to the Duoro Valley. You can try to make your own tour by taking the train, but the times are kind of awkward so we booked a van tour. 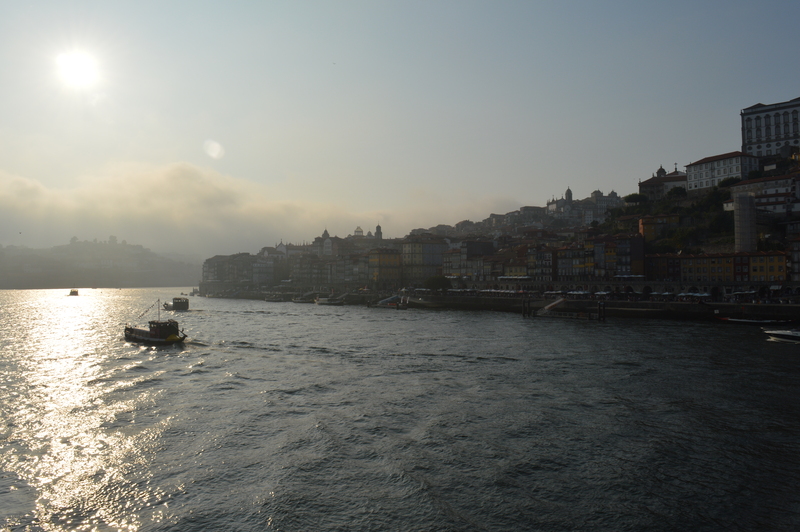 We took Cool Tour Oporto, booking the 100 euro excursion (including the suggested boat cruise). 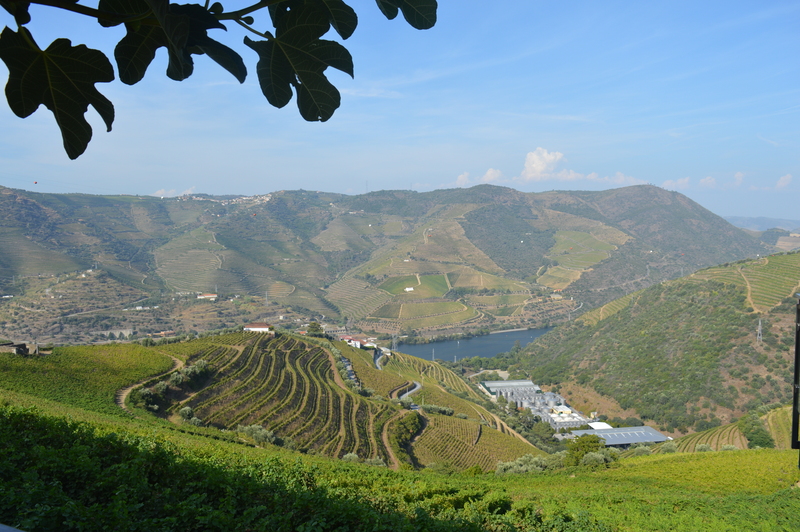 The tour includes an informative 90 minute van ride (each way) with a driver and 8 passengers out to the northeast part of the country, the beautiful Duoro Valley, the premier wine-making region of Portugal. On our trip (sometimes the order changes due to weather), we trekked to the small town of Pinhão, where we embarked on a relaxing hour-long cruise of the Duoro River (great vistas), explored the town a bit, and hit up two fantastic wineries with tastings of red and white wine, port, olive oil, and honey (lunch sandwiched in between). 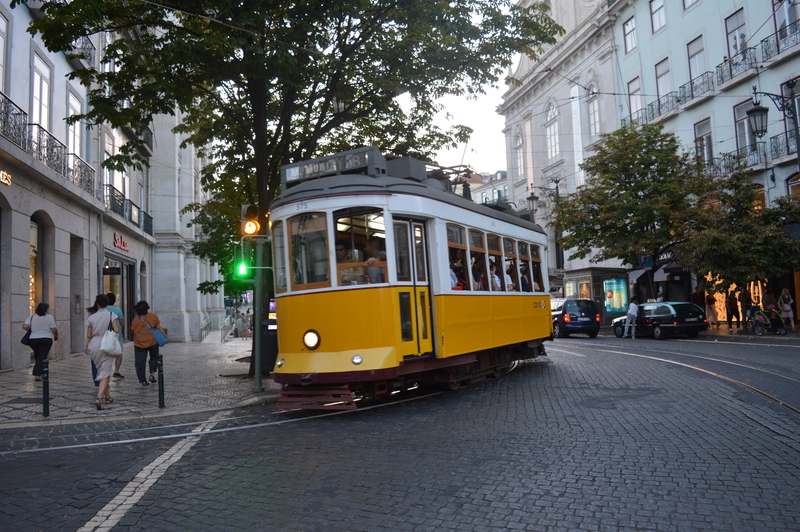 After a few nights in Porto, we took the train (about 3 hours, 12.50 euros) back to Lisbon (Santa Apolonia) station to check out Portugal’s capital and largest city. Our Airbnb straddled the recommended Bairro Alto and Chiado neighborhoods overlooking the Praça Luís de Camões (lots of folks will tell you stay in the older Alfalma neighborhood or nearby, but it’s apparently not as fun late night). 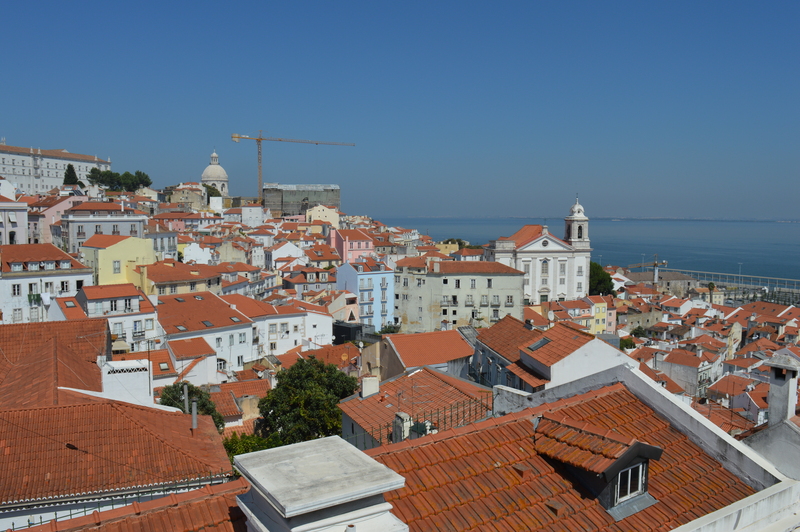 Lisbon is an incredibly lively place, wither people and hills everywhere. After getting situated, we Ubered over to the São Jorge Castle (a taxi may be a better idea since the Uber dropped us off several blocks downhill from the castle since it’s a restricted area). We actually didn’t go inside the castle proper, but walked inside the walls of the surrounding village and explored. We then walked down through the Alfalma (check out the Miradouro de Santa Luzia viewpoint) neighborhood; very narrow streets and old ladies selling 1 euro shots of the popular sour cherry liquor (Ginjinha, try it in a chocolate cup). Afterwards we Ubered over to the Rossio square, where we took a great 3 hour (45 euro) Inside Lisbon Food & Wine Walk, which took us through the Baixa (downtown) and Bairro Alto neighborhoods with tastes of the ubiquitous cod fritters, vino verde (green wine), tapas, red/white wine, port, ginjinha, chorizo, and bread with a fun group and tour guide. You’ll notice that Portugal has a lot of beautiful tiles; great replicas can be found at Fábrica Sant’Anna in Chiado. We also headed over to regal neighborhood of Belem, and checked out the grand Jerónimos Monastery, the Monument to the Discoveries (kind of a pro-colonial massive monument with great lookout), and the famous Pasteis de Belém which cranks out these delicious legendary custard pastries. Food: Lisbon has great food. 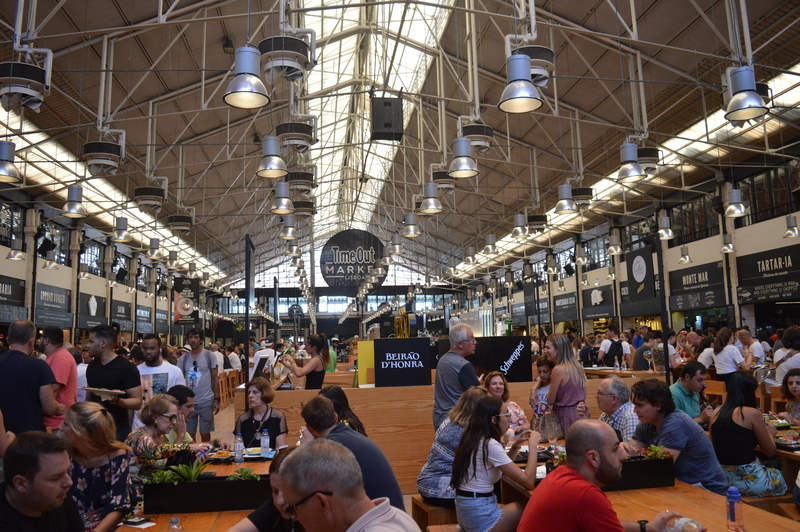 You’ll find it hard to resist making multiple trips to the hipsterish Time Out Market, a great food hall in the Cais do Sodre neighborhood (good place to grab lunch before taking the cheap train to Belem). There are tons of options; including one side that features famous Portuguese chefs. We had a terrific suckling pork sandwich and salmon tataki at the Henrique sa Pessoa stand. 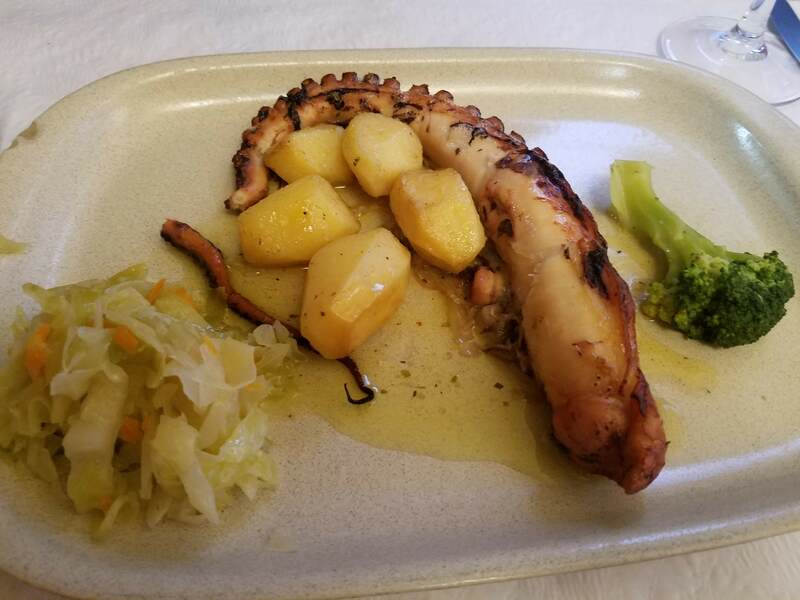 We also had a great dinners at Cantinho do Avillez in Chiado (José Avillez seems like a Jose Andres type restauranteur with several concepts around town), L-Bistro in Cais do Sodre, and Carmo. Try to grab a bifana sandwich while you’re in Lisbon-a simple cheap sandwich with thin slices of pork tenderloin (O Trevo has solid ones in a spartan snack bar setting). Late night, old dudes carrying boxes of freshly baked pão com Chouriço (literally rolls baked with Portugese sausage) roam Bairro Alto to sell to revelers; these are awesome and remind me of my beloved WV pepperoni rolls. 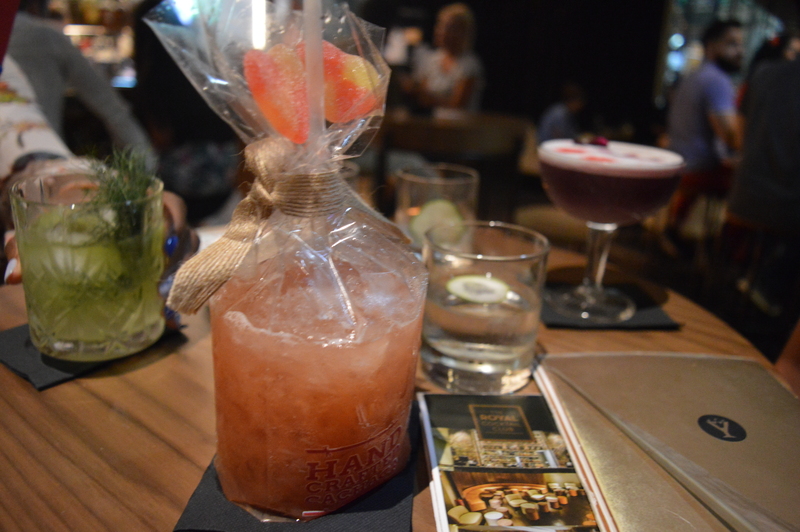 Drink: Lisbon is a great party town. The Bairro Alto neighborhood has tons of bars in their narrow streets. When the weather is warm, folks just goto any spot and grab a cheap drink and take it outside. There’s a very popular folk style of music in Lisbon called “fado”; most tourists will go to a pricey dinner that includes music and sit for a couple hours. We weren’t as patient and found a spot called Tasca Do Chico in Bairro ALto and lined up until folks left after the previous set and heard some great music. Another wild nightlife area is the so-called “Pink Street” down the hill in Cais do Sodre. Lots of locals and guys and gals from Portugal and the UK on their bachelor/bachelorette parties there. A few blocks west of Bairro Alto is one of the cooler bars I checked out in Portugal: PARK, which is a rooftop bar on top of a parking garage with a tremendous atmosphere playing old school hip hop. 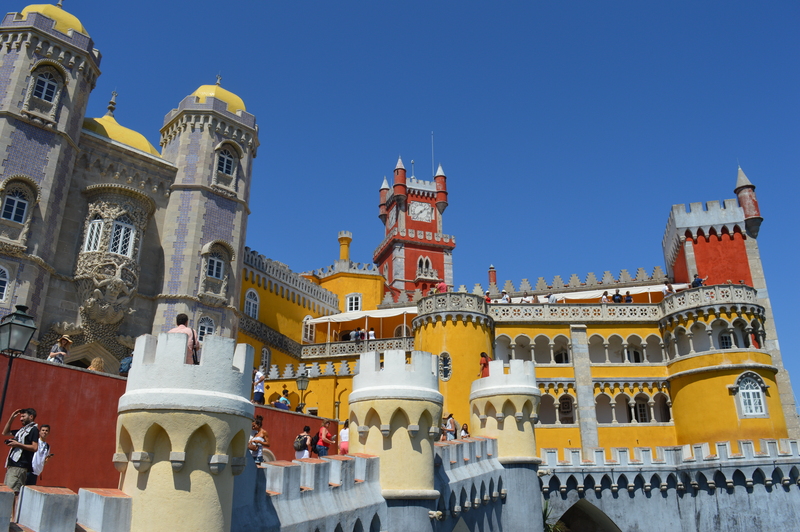 A common day trip from Lisbon is the charming town of Sintra. Most people take a cheap train, but since there was 3 of us and got a late start, we took an Uber which was only about 25 euros for the 45 minute ride. Half the time was spent navigating the bumper-to-bumper traffic to top of the hill upon which the Pena Palace is situated. The Palace, which was built with his own money by a German dude who married the Portuguese queen in mid 19th century, evokes German castles and looks like Magic Kingdom at Disney World. Highly recommend buying tickets in advance, and pony up 3 euros for the round trip bus ride from the ticket entrance to the palace itself to save time and energy. The place is ridiculous with jaw-dropping views. 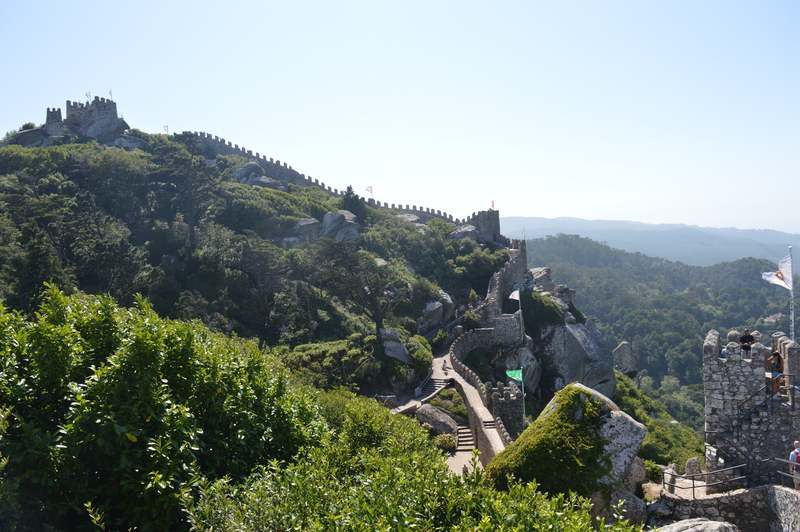 Afterwards, we hiked down 10 minutes to the Moorish Castle, a classic castle that dates over 1000 years and explored the ramparts. If we had more time we would have explored the Quinta da Regaleira and the town of Sintra itself. Instead, we took another 20 euro Uber to the charming seaside beach town of Cascais and explored a bit before heading back to Lisbon (cheap 45 minute train or 25 euro Uber).